Ask any business owner, and they’ll tell you that opening up a retail space is a lot of work. Factors like location, floor space, stockroom space, overhead costs, and so on mean that a lot of careful planning and analysis has to come into play. If you can expect such analysis with a physical store, you should certainly expect nothing less when trying to setup an eCommerce platform. Just like you wouldn’t choose just any retail space for a store location, you shouldn’t choose just any platform to operate your online store from. Figuring out what platform is going to work for your business can be a challenge, especially for those just starting out in business. Here you’ll get a step by step guide to not only understanding the approach you need to make toward eCommerce, but also to how to pick a platform that’s perfectly suited to your business needs. Before you can start looking through different online platforms, you have to have a very solid idea about what it is you’re wanting to present to your consumers. Having a website isn’t just about selling your products; it’s also about expressing who you are as a business person and what your company represents. Understanding the impression that you want to make with your customers is essential in understanding how you need to design your website. This understanding will help you figure out the sort of things you’d like to focus on, such as written content, graphic media, videos, and more. How do you want your business’s style to be translated to the consumer? Are you looking for something that’s sleek and professional, or perhaps something that’s a bit more cutting-edge and out of the box? Details like this are important to figure out, because they’ll give you a better sense of what it is you’re looking for in a platform. Different platforms will offer different features, so you definitely want to know how you’re going to utilize a platform before you make your decision. What you’re able to spend on an online platform is certainly going to play a major role in what you end up choosing. Prices are going to reflect the different features and compatibilities that are offered by a platform, and this is what you really need to pay attention to when it comes to cost. When you’re comparing the costs of various platforms, you have to be mindful of what comes with higher or lower price tags. One platform may cost 50% or 100% more, but offer far more features and versatility. Again, this is one of those areas where a thorough analysis of what you’re trying to achieve with your online business is going to come in handy. Some companies will include features that you really need for your particular vision, such as the ability to offer discount codes, set up wish lists, or provide support. Others, however, will offer these features along with an additional price tag. This is one of the reasons why you need to study the short-term vs. the long-term costs of the platforms you’re considering. Some may cost a little more to purchase, but will save you a lot more money than others that will require you to purchase add-ons in order to maximize your website’s potential. Look for a platform that provides you the ability to offer the most products, visual and descriptive content, and apps for the lowest overall price. It also pays to be a little bit cautious at first. Find a good platform that offers plenty of features for a reasonable price that won’t break your budget, but don’t opt for a package that comes with what seems like a limitless supply of features just because. After you get your online shop up and running, you can track the way in which your customers are viewing and buying your products, as well as pay attention to their feedback in order to understand how they’re responding to your content and the various features your site offers. Once you have a more solid understanding of what your particular demographic is looking for, then you can go back to reevaluate what you want out of your site’s platform. This way, you avoid paying for a bunch of features that customers won’t even use or may find annoying whenever they visit your site. The internet has most certainly revolutionized the way in which we do business in the 21st century, and developing technology is only continuing this revolutionary trend. More and more people today use smartphones and tablets to shop online, but not every site is fully compatible with these devices. This has caused eCommerce businesses to scramble in an attempt to adapt their platform’s compatibility, rather than lose customers to their competitors who have already upgraded their websites. The use of smartphones and tablets to shop online is no longer a niche market, as it now makes up a large chunk of how people shop online and otherwise access the internet. Access is another key point to keep in mind. Not only do you need to have a website that’s compatible with a wide range of devices, but you need to be sure that your chosen methods of interacting with customers is fully accessible. This means using social media that’s linked to your website in an effort to create a more genuine rapport with your customer base. Many websites include a blog section or a link to another platform that features their blog. Either way, this is a smart route that any business should take, ensuring in the process that consumers can access this content no matter what they’re using to get online. The way in which you host your new platform is going to be a factor in making your choice between one platform type and another. In order to host a website, you need a server that can act as its base. You can host the site yourself from your own server at home or in a physical store location, or you can purchase a server through a software company that specifically offers such space to businesses looking to host their websites. The difference between hosting a site yourself and hosting it somewhere else boils down to cost, involvement, and security. Your website is going to have access to a wide array of personal information, including customer’s credit cards. Hosting services offer added anti-virus and anti-malware security, and various encryption services, in order to keep your website safe from hackers. However, you can install anti-virus software of your own and host your website yourself, still maintaining security as long as you routinely update your software and website to make sure it’s free of any possible hack points. Hosting yourself may also save you more money, depending on the kind of anti-virus software you get and whether or not you want to hire someone specifically to perform online maintenance for you. How much you’re having to spend on hosting is in turn likely to affect the amount of money you’re able to spend on a platform service, so this is a factor you’ll want to have already decided. You could probably group these two issues in with a platform’s features as a whole, but they deserve some specific attention. When thinking about flexibility, you need to consider not only the products and services you’re going to be offering, but also the sort of content you’d like to share with your site’s visitors. When analyzing a platform’s flexibility concerning your products, pay attention to the amount of products you’re able to list compared to the price you’re paying for the platform. Also pay attention to the way in which you’re able to present your products. How many photos are you able to show of different products? How much of a description are you able to give? Will the platform give you the ability to thoroughly categorize your products in a way that will make sense to customers, therefore making it easier for them to shop? Content flexibility is also extremely important, as this is one of the main ways in which you’re able to connect with your customers. Pay attention to whether or not you’re able to add videos and other graphic content, along with the kinds of links you’re able to incorporate. For example, you may wish to exhibit moving graphics, images in slideshow formation, or include a news and events page that allows you to post videos and other multimedia content. Even if you’re not thinking of doing this at the moment or just don’t know precisely how you’d like to incorporate various forms of content, it’s a good idea to pick a platform that at least offers some decent flexibility for what you might like to do later down the road. A website’s quality is every bit as important as what it is you’re selling. After all, the quality of your website has a lot to do with getting customers interested in products and services, and subsequently purchasing from you. You’ll want a platform that’s not only fast but that also offers excellent resolution and download/upload abilities. Whatever multimedia you’re wanting to showcase on your site needs to have a flawless quality to it, which means pictures shouldn’t be grainy, audio and video shouldn’t lag, and nothing should have a problem quickly uploading. If you’re offering products or services that require users to download them from your website, then you definitely need to find a platform that will allow for fast downloads; otherwise, your customers are going to feel as if the money they’re paying for what you’re offering just isn’t compatible. We’re not all graphic designers or software experts, and while many platforms are fairly straightforward to set up and use, it sometimes pays to have some expert help. Finding a team of designers and managers that can help you get the most out of your platform’s features will go an extremely long way in helping you fully realize the vision you have for your eCommerce business. Many business owners often find that the platform services they’re using offer many more possibilities than they were aware of, but it took an expert web designer to create the right coding to maximize their website’s potential. An expert web service can also help you create a plan for the future of your online business by analyzing what your platform is capable of, when and how to convert features and even the platform itself in order to expand your options, and how to reduce site cost and maintenance. Not sure how to create amazing content for your website? 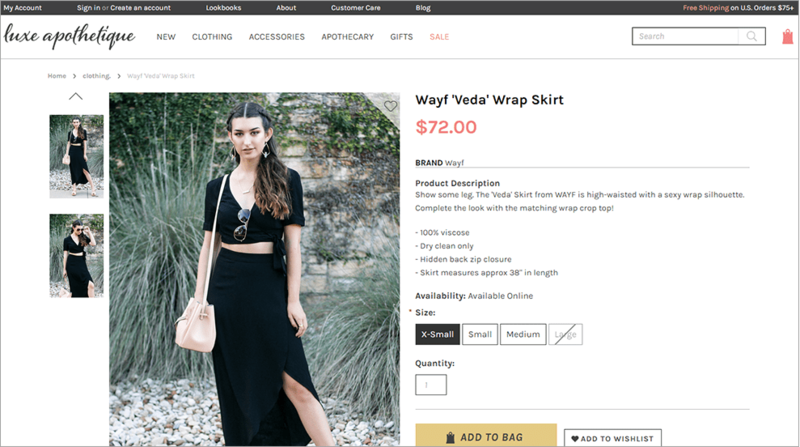 An eCommerce service team can either help you create this content or put you in touch with someone who can, and then help you incorporate this content into your website in a way that makes sense and delivers big impact. Having an expert group at your disposal can also be a saving grace when it comes to marketing. Your website is like a store and a billboard all in one. The content you’re showing on your website has to create the right sort of brand experience, and promote your products and services in the best way possible. One of the best things about a development team is that if you just can’t decide on a platform, they’ll be able to analyze your company’s needs and find the platform that fits them. With this in mind, look for a service that not only has plenty of experience to call on, but which also promotes itself as having experience with a variety of online platforms. This way you’ll know for sure that a lot of the guesswork is going to be taken out of the equation, and you won’t have to worry about ending up with a service that basically helps you pick out a platform through trial and error.